Direct mount air solenoid valves can be adapted for 5/2 or 3/2 NC functions for electrically controlling double acting or spring return air actuated valves. Valves mount directly to actuators with the international standard Namur interface saving time, space and plumbing. Compact high flow design includes a black anodized aluminum body with a low wattage molded coil. Unique long life spool and sleeve design can be used with lubricated or non-lubricated compressed air. Twist and lock manual override is useful in operating the valve during setup, testing or power outage situations. Easy to wire 1/2" conduit DIN plug connector with screw terminals is included with each valve. This valve offers excellent environmental protection against the ingress of liquids, dust and other foreign matter. Optional actuator speed controls and mufflers are listed under accessories. 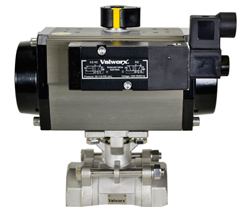 These solenoid valves are PRE-INSTALLED and TESTED when ordered with a Valworx air actuated valve.